Posted by Brittany Bosher on Friday, January 29th, 2016 at 9:58am. Found within the gorgeous Marriot Hotel in Singer Island is the delicious, gourmet eatery known as 3800 Ocean. 3800 Ocean proudly serves local dishes that are inspired by all different cultures. All of the dishes served at this gorgeous restaurant are made fresh, in house and completely from scratch making 3800 Ocean one of the top spots in Singer Island. 3800 Ocean offers breakfast and brunch menus as well as dinner menus and a five-course, prix fix offering for its guests. 3800 Ocean is located at 3800 North Ocean Drive in Singer Island, Florida. The Mediterranean Taverna is nestled on a rooftop boasting incredible views of the ocean. This authentic Greek restaurant serves only the best, traditional Greek plates. The Mediterranean Taverna has been called the “best brunch for miles” by TripAdvisor and has an outstanding reputation from locals. The Mediterranean Taverna is located at 123 South Ocean Avenue, West Palm Beach Florida. One of Singer Island’s most popular bar and restaurants is Two Drunken Goats. Two Drunken Goats is a beachfront bar with a relaxed and welcoming ambiance that is meant to be a “great place to unwind, have a drink and enjoy great food… with a world class view thrown in for good measure!” It is a true beachside restaurant with an American-Mexican inspired menu and an incredible cocktail list. 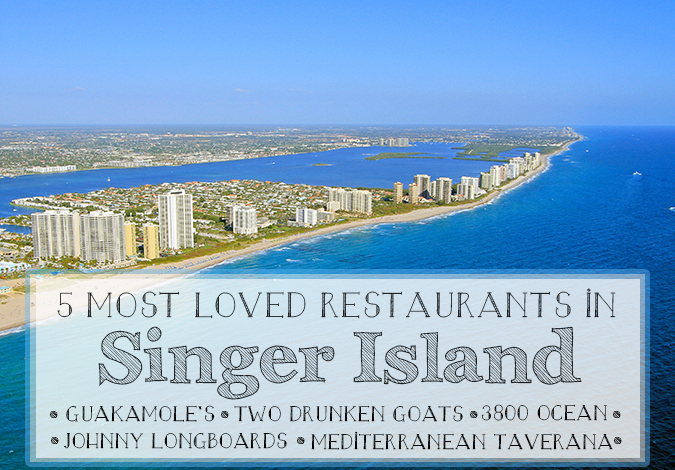 Two Drunken Goats is a must try on Singer Island’s list of best restaurants. It is located at 2509 North Ocean Avenue, Singer Island, Florida. Looking for a delicious, authentic Mexican Cantina on Singer Island, try Guakamole’s! Guakamole’s offers traditional Mexican dishes like flautas, enchiladas, and tacos and of course all of the famous south of the border drinks. You may enjoy a variety of fine tequilas and unique margaritas all within the causal and laid back atmosphere that is Guakamole’s. Guakamole’s is located at 1281 Plaza Circle, Suite A in Singer Island, Florida.